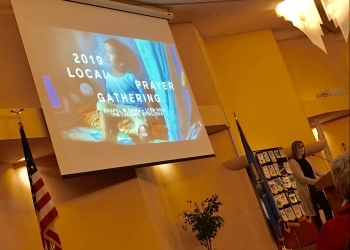 Oklahoma Wesleyan University's Orange Movement Director Marci Piper lead a discussion on human trafficking at the Bartlesville Community Center Monday. Rotary Club 190 members listened to Piper speak during their weekly gathering as she talked about the potential rise in cybersex trafficking. Piper said there are more slaves today than there were in the 1800s. She said human trafficking is a $150 billion industry that has surpassed the drug industry. There are over a 40 million people globally impacted by slavery today. According to Piper, human trafficking is seen as more profitable by the offenders because drugs can only be used once but bodies can be used over and over again. As Americans, she said we are blessed to be where we are and we need to take that blessing to enact much needed change. 1 to 4 victims of modern slavery is a child. Piper said the Orange Movement at OKWU follows the example of Orange Scott. Scott was one of the original founders of the Wesleyan Methodist Church. Piper said Scott is part of Wesleyan heritage and he himself had a movement against slavery in the 1800s. The Orange Movement has been involved in Southeast Asia. They also focus on a 4 P's Model with prayer being the most important. The other "P"s include: prevention (education and awareness), protection (supporting victims), and partners (being part on International Justice Mission Chapter). Piper said a prayer gathering will take place at the Oklahoma Wesleyan Chapel in Lyon Hall Tuesday, April 23rd starting at 7 p.m.